I was a fan of The New Defenders, (as the final couple of years of Marvel's first Defenders series was called). The stories were fun, but what I really liked was the line up - Angel, Ice-Man, Beast, Moondragon, Valkyrie and Gargoyle. after the series ended, all of the other characters found homes in other team titles except for Isaac Christians, The Gargoyle. He's made only a handful of small appearances since, and it's too bad because I think he is a great character with a unique perspective. I'd love to see him featured more prominently somewhere. *How many others remember the GA limited series where Ollie came back as a hollow (a sort of sentient, non-brain-eating, zombie)? 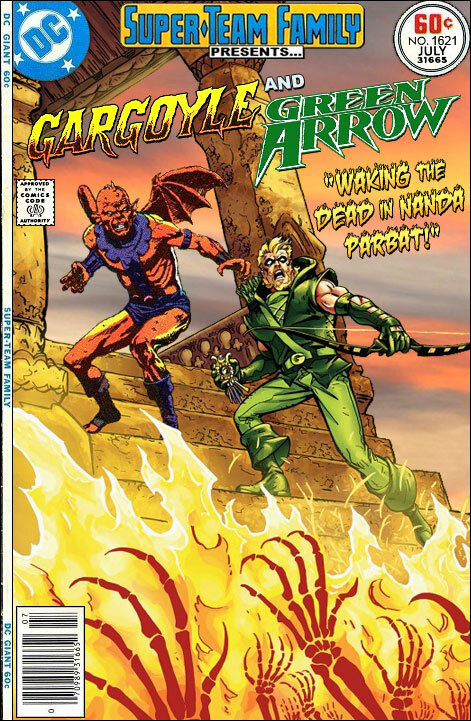 Not really a limited series--it was the first arc of Kevin Smith's Green Arrow run. I noted several days ago about how, in what you do, it's sometimes difficult to get good interactions between characters. On this one, what's great is, both characters are posed in the same going-up-stairs, looking-back-in-horror poses. You must have an encyclopedic knowledge of cover art to be able to pull things like this together. Nice work. @Mr. Acer: it was still a limited run. regardless. The present TV series has lasted longer!